This is taking *forever* | carpe diem! I have a thing about skeletons and bones, skulls in particular. I like them. I think they’re wonderful structures, amazing feats of engineering, and for me they symbolise both life and death. This ring from The Great Frog incorporates all that; I love the contrast between its meaning for me and the Heavy Metal ‘skull with rats’ design (the rats are investigating a gaping hole in the back of the skull :-). I must confess that I also enjoy shocking people who don’t know me. The other birthday gift is under discussion: he wants to buy me a really good spinning wheel, something that I’ll use and love for decades (he is a keeper, isn’t he?) and my sister wants in on it too. I’ve been reading reviews wherever I find them, paying attention to the wheels used by noted bloggers and professional spinning folk. I think… I think my dream wheel may be a Schacht Matchless double treadle. But it’s a lot of money and my spinning wouldn’t do it justice. Yet. It’s very tempting, though. Back to work. I have to finish something so I can invoice someone so I can justify drawing up a shopping list for the Knitting & Stitching Show at Alexandra Palace. I wonder if anyone there will have a Schacht I could look at? PS. I’ve just remembered I should have mentioned: the handspun Wool Peddler Shawl was delivered to my mother’s door the day before her birthday. When I rang to wish her Many Happy Returns she was wearing it, or at least said she was. It’s a great success! Hurrah! This entry was posted in Uncategorized on October 1, 2007 by sarahw. The cherry leaf shawl looks fab! I made mine bigger too & it makes for a good wrap/scarf style shawl. The border was a bit of a bind but not as bad as I thought. The ‘big birthday thing’ -well I had mine in June & it actually prompted lots of suprised ’50? you? never would have guessed it’ type comments. No-one ever said that when I was 49!They celebrate a half centuary in cricket! A lot of people seem to be stalling at the moment, myself included, perhaps it’s the change in the season. 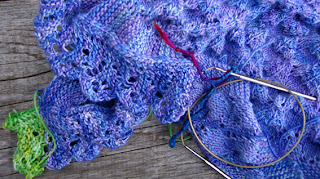 Keep plugging away at the shawl though, once it is blocked you could fall in love with it. I have a set of Denise interchangeables and also a set of Knitpicks. (plus a few other needles!) I prefer the Knitpicks every time unless I am knitting something that needs quite a bit of grip. The only draw back I can find with the Knitpicks is that one set may never be enough!Happy half centuary. Have a great time at Alexandra Palace, I’d love to go but it’s too far for me with current going on. I’m relying on you to shop enough for both of us though!! Those few who have been told I’m soon to be 50 are, well, flabbergasted. I don’t look it (perhaps the skulls help?) or act as ’50’ is supposed to behave and with a bit of luck I never will! Mindie, if there’s something you particularly want or would like a report on, let me know. Mindie is right about the needles. I like the KnitPicks ones and wooden/bamboo ones (haven’t tried the new Harmony ones) much more than my Denise needles. I do still carry the Denise set while travelling though because it is so compact.I have a Schacht. It is a versatile, sturdy, informal wheel. It’s also pretty expensive for what it is right now–Lendrums are just as good, in my opinion, and less expensive. (got mine new at about half the price a few years ago) If I got that “offer” of a really sturdy fancy wheel, and I were a lace knitter like you, I might consider a Timbertops, Watson, or another handmade wheel with a good ratio for lace weight fine yarns. Just a thought. We can discuss via email if you’d like? I’ve tried a lot of wheels! I love my Schacht Matchless. It is so worth the money, and it’s a wheel that you will never outgrow. 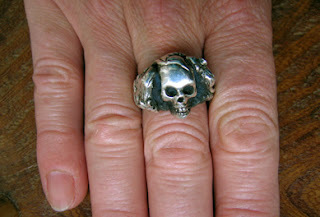 go for it.and the skull ring is great – happy birthday. Happy Birthday! There is something marvelously intriguing about someone who knits lace shawls and wears a skull ring…good for you! I hope you find the wheel of your dreams and enjoy your day and year to the fullest. I adore your attitude! You are <>Dark<> (skull with concomitant rats), offer the occasional <>Snark<> (“I am so looking forward to that (crochet, that is)…”) and awfully smart, to boot.Happy 5th decade of roaming the earth, taking names and kicking b*tt! happy B’day! I’ll join you soon in the big 50 in a few months!can’t wait to see your new wheel and the spinning that comes from it! !